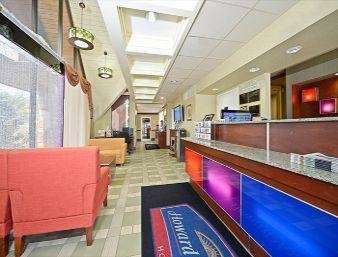 Find many fun-filled family adventures near this Howard Johnson Inn Clifton NJ conveniently located near the New Jersey Turnpike and Garden State Parkway. Cheer for the New York Giants at Giants Stadium, or see concerts at the MetLife Stadium less than 15 minutes away. Take a trip to New York City less than a half hour away to see the Empire State Building or the Radio City Music Hall. Find a meal for the whole family at Tick Tock Diner less than two miles away, or IHOP across the street. The friendly 24-hour front desk staff is available to help plan your day, and you can research attractions on the complimentary wireless Internet access. Complimentary car and large-vehicle parking. Stay productive in the meeting rooms and business center. Comfortable guest rooms include microwave, refrigerator, coffee-maker and hairdryer. Smoke-free and handicapped-accessible rooms are also available. There is no charge for children 17 and under with an adult.